Amazing high performance, compact size, and full featured! The IP54 is an European system of test specification standards for classifying the degrees of protection provided by the enclosures of electrical equipment. IP54 means the case is protected against dust limited ingress (no harmful deposit), and protection against water sprayed from all directions (limited ingress permitted). Specifications subject to change without notice or obligation. 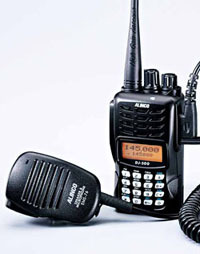 Specifications apply to Amateur Radio bands only. Permits required for MARS use. Product intended for use by properly licensed operators. Accessories may differ depending on the versions. Please contact your dealer for standard accessories and warranty-policy. Li-ion Battery Pack DC 7.4V 1700mAh (EBP-88) Belt clip not included. * Voids IP54 ingress protection when EME-56A and/or EDH-40 are in use. Please be advised that this is a freeware. Although we have tested this software on our Windows Vista/Seven 32/64bit environments and experienced no serious accident during the operation, we are not responsible of any eventual damage caused to your radio and/or PC system by using this utility. Sorry, please do not contact us for how to use the software, as this is a very simple editor software. The updates will be posted here as soon as available. Please uninstall the older version before you install the latest one in case of update. This utility enables you to program frequencies, set parameters and save it in your PC for any version of DJ-500. * Click on the icon to start installation. Please select correct COM port before start using the program. Before start editing, click on the MODEL menu in the tool-bar, and select the correct version of your DJ-500. To edit memory channels, select CH page. Double-click on the cell and write the data. The Radio page is for FM broadcast station frequencies. 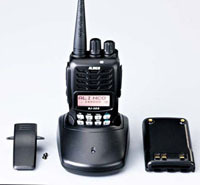 Some features may not be available depending on the version you use (these parameters are for commercial-use and not used in amateur radio communications). Before you edit the real data, program some fake data to become familiar with the utility interface and how the radio works after programming. Please remember that you must have Alinco's optional ERW-4C or ERW-7 computer interface cable in order to connect the unit to your PC. A simple connection cable doesn't work properly.